My three little ones love to draw and play games so the new Pick and Draw game is the perfect combination for fun and imaginative play. We played this game recently and it was lots of fun. The game play itself is very easy to learn and my children picked up on it quite easily with a little coaching at first from me (they are 3, 4 and 5). 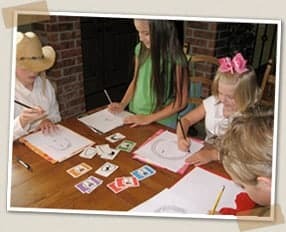 Pick and Draw is such a unique game as it actually teaches the child how to draw fun cartoon faces and the possible combinations are virtually endless making this a unique and fun game time and time again. It was created by artist and teacher Rich Davis who wanted to empower children and unlock their creative potential. What I like is that this game can be played by several children or just one. My five year old son sometimes wants quiet time by himself without his younger siblings and he has asked me numerous times if he can playPick and Draw alone in his room. It is so much fun to watch how excited they get by the pictures that they draw and I love how it inspires their creativity and imagination. I also enjoy using Pick and Draw during our home school day too when I am setting up for the next assignment and I need to keep the kids occupied for a few minutes in between….it is perfect. Interested to see how it works? You are invited to check it out on the Pick and Draw website “How to play Pick and Draw” and I warn you it is a lot of fun so you just might get hooked yourself! Pick and Draw is an excellent value in my opinion for only $10 because in a short time it has gotten much more play time and interest from my children than games that I have paid over double/triple for in the past. To order the Pick and Draw card deck game for $10 and have a fun hit for your next family game night head over to the Pick and Draw website.